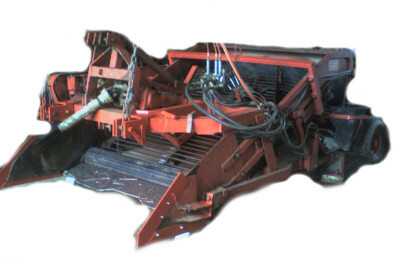 Bray Valley Machinery are manufacturers and suppliers of potato and swede harvesters, and related machinery. Established over 25 years. Located near South Molton in North Devon, England. Bray Valley "Gymnast". 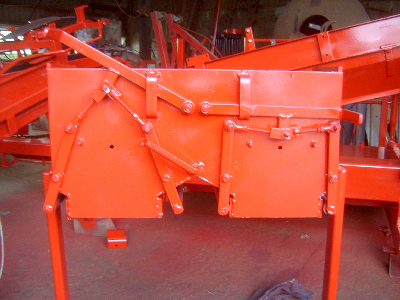 Single row, fully mounted, potato harvester. Includes lifting web with a haulm extractor web, sorting/grading table with central divider, conveyor system and front-fitted fork-lift for filling a 1 tonne box. Canopy and bagging system optional. 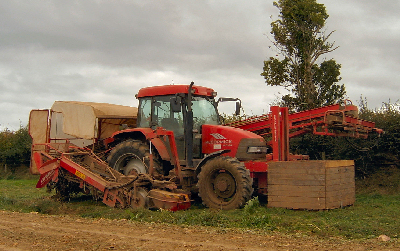 Driven by hydraulic pump connected to tractor's PTO and from tractor hydraulics..
Swede harvester with topper, sorting table and front-fitted fork-lift for tonne box. Fully mounted from tractor. Canopy optional. 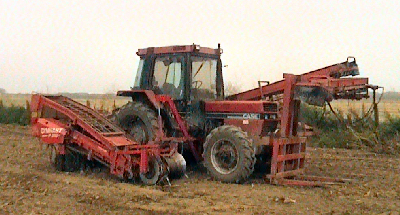 A 2-row de-stoner for preparing ground before planting potatoes. Reversable rear conveyor deposits the stones in the wheel row. Lifts completely from ground for transport. 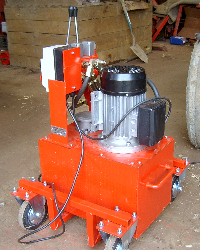 Mains electric powered hydraulic power pack. Suitable for powering a range of hydraulic equipment including grading tables and our 1 tonne box tipper. Comprises a single-phase electric motor, hydraulic pump, oil tank and controls. Can be supplied with a wheeled trolley, as in the photo. Made to your requirements. For tipping one tonne boxes of potatoes, swedes, etc. 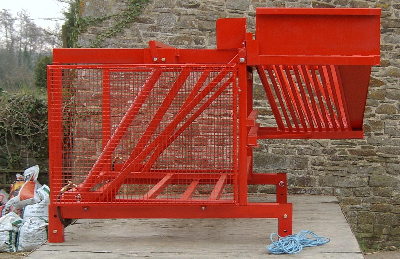 onto conveyors, grading tables, etc..
Stand-alone bagging unit for holding 2x 20Kg or 25Kg potato bags. Spare parts, servicing and repairs are available. Each machine is made to order and can be adapted to your requirements. Mountings can be made to fit the potato or swede harvester onto most tractors. If you would like to know more, please email me or telephone 01769 572268. Please note: delivery is within UK only. Address: Fullabrook Farm, Chittlehampton, Umberleigh, Devon. EX37 9RE. This is not an official Bray Valley website (there isn't one) but it is my place of work.